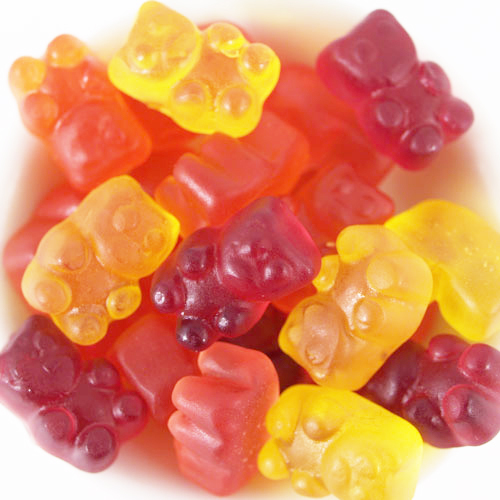 Traditional, chewy-style gummy bears, now made without corn syrup. Bright, clean, yummy flavors. Made with organic sweeteners. Contains gelatin. Click on 'Larger View" above to see packaging. Ingredients: Organic tapioca syrup, organic cane sugar, gelatin, organic grape juice concentrate, citric acid, lactic acid (non-dairy), ascorbic acid, colors added (organic black carrot juice concentrate, organic turmeric, organic annatto), natural flavors, organic sunflower oil, carnauba wax. Misc. info: Package states this product is GMO free. May contain trace amounts of corn starch from the molding process. Vegetarian info: This item is not vegetarian. It contains gelatin. Each 2.75oz bag contains approximately 32 bears. Each 10 lb. bulk case contains approximately 1,850 bears. THIS IS GOOD! EAT IT!!!!EAT!!! I love how they tastes just like a real bear! furry crunchy goodness mmmmm i have stopped hunting down bears in the wild, now i just buy these they are sooo good MMMMMMMMM!!!!!!!!!!!!!!!!!!! This is the best organic candy I've had in years. I stopped buying candy of any kind from stores because of all the artificial garbage and aspertame in them. This is the only place I buy my candy from. Great delivery and great prices. Thank you ! Very Good, Ive loved Gummy Bears since I was a little girl and these really hit the spot while I was on my new healthier eating journey. I cant live without Gummy Bears and these definietly do not dissapoint! Try them, betcha cant eat just one! You cannot find gummy bears that taste this good in the stores. I got these as a sampler, and let myself, daughter and grandchildren try them, and we all loved them. Will be ordering these soon. These gummy bears were pretty good. Not too chewy or hard, yet not too soft either. The outsides were not oily and I had no issues eating them. The packages were a bit too big so I always shared them. You can also put them in a zip bag an eat the later. Will buy again. Because my son is on a gluten/casein/soy free diet, it's hard to find reinforcers for his ABA therapy. These are incredible and my son LOVES them, thank you for a great product! !